When the clouds parted you could hear people gasp! young people were filled with the Holy Spirit! AFTER READING THE SCRIPTURES PASTOR MAX PRAYED FOR A MIRACLE. IMMEDIATELY THE CLOUDS PARTED & THE SUN SHONE FOR MANY HOURS IN THAT SPECIFIC AREA. PEOPLE STILL TALK ABOUT IT TODAY 47 YEARS LATER.!!! More than 1500 people witnessed the miracle of God holding back the rain in a ten mile radius during the final meeting. On Saturday during the night a powerful storm had destroyed the old Gospel Tent. There was a general rain across Manitoba on Sunday except in Steinbach and immediate area. 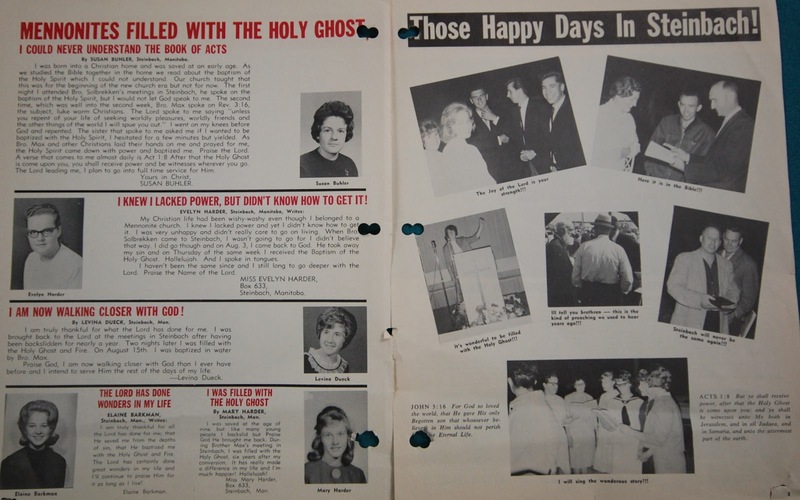 After the Crusade, Pastor Max Solbrekken, Evangelist Sam Bilsky and businessman Peter Enns founded the Full Gospel Chapel with 89 people at the first meeting, renting the basement of the Lutheran Church. Up to that point only two families were Pentecostal. Now there are several thousand Full Gospel Christians in Steinbach and area. To God be all the Praise, Honour and Glory! There Were No Dry Eyes When Tilley Witnessed for Jesus! Pastor Max honours Tilley's request and prays a father's blessing upon his daughter in the Lord at September 2012 Sixth Anniversary Prayer Conference at Christ the Healer Gospel Church. 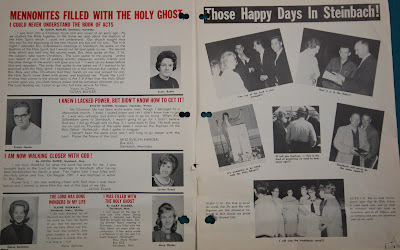 My name is Tilda Harder I wanted to let you know that if you had not been faithful to God in 1965 when you came to Steinbach MB. I don’t believe I would be alive today and if I was, I don’t believe that I would be a Christian. I wanted to thank you and tell you just how much it meant to me and my family that you preached God’s word and introduced us to the Holy Spirit. We were never the same again! I gave my testimony at a women’s retreat a number of years ago and if you have the time to read it all, feel free, and if not towards the end I write about the impact you made on my life for eternity. For ETERNITY!! Thank you for giving the little girl in this story, me, hope in Christ, and just hope. I had none at all, but your tent revival gave me hope and I sensed the love of God for me for the first time that I could remember. God bless you! Here is an excerpt of her horrible childhood with an unbelievably wicked father who abused her in every possible way: M.S. When I was about 11 or 12 years old God intervened in our lives again. This was an intervention that would change the course of my life for eternity. Even though I had accepted Jesus as a young child, the way Christianity was playing out in our home was having quite a negative impact on me spiritually. Powerless religion was not enough to keep this wounded family spiritually alive. God knew this. Something was about to happen in spite of dad’s free will. My father became interested in Pentecostalism, if there is such a word. We would go to Calvary Temple in Winnipeg once in a while. 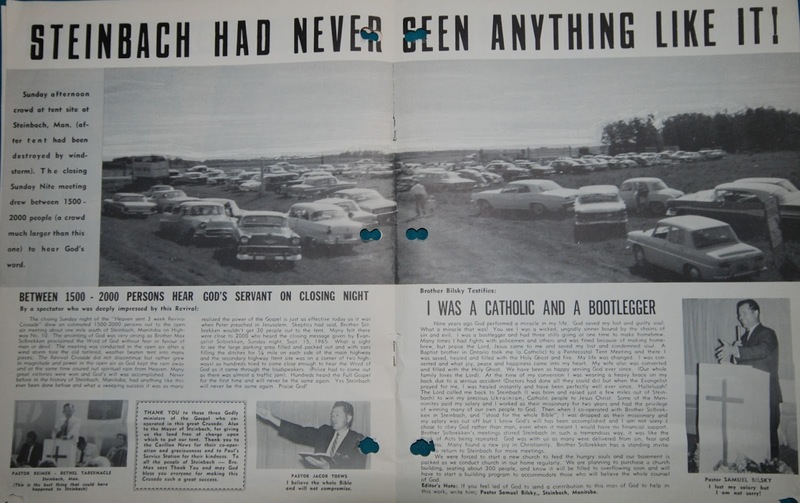 But where I experienced church as a living, breathing, life changing, powerful revelation of God and His love was when dad took us to camp meetings where a Norwegian evangelist from White Rock, Max Solbrekken was preaching. The power of God was so strong in that old canvas tent. There were many miracles and testimonies. Testimonies that moved this young girl so deeply. Testimonies of God’s power. Power to deliver. Power to save and to heal. In Those tent meetings is where my worship experience with God began. Oh, it was like water being poured on a desert. God breathed something in me that Satan would try to destroy over and over again, but he would not win. The experience of Gods power through the Holy Spirit was indestructible!! I needed to experience God’s power in order to continue to live. I NEEDED SOMETHING THAT WAS BIGGER THAN MY DAD! Something that was bigger than the demonic. And even though I would become quite the prodigal later in my teen and young adult life, the power of God was something I never could forget. That God was real, I now knew beyond all doubt.!! I NEEDED HOPE! My dad continued to have free will and he continued in spite of everything to abuse. His brutality did not stop. But God had breathed new life into me. Something that would keep me till I could spiritually breathe again. Nothing in hell could separate me from this new found love. But hell would try. Worship became a very big part of my young life. I remember playing accordion, sometimes guitar in my room and singing worship songs and the power of God would fill the room as I would worship. God gave me very intimate times in His presence. I had no other intimacy. I had found someone who cared for me even though I could not seem to receive it or believe deeply as I would have wanted to. But in worship that was not my reality. In God’s holy presence I was in heavenly places, in Christ Jesus. 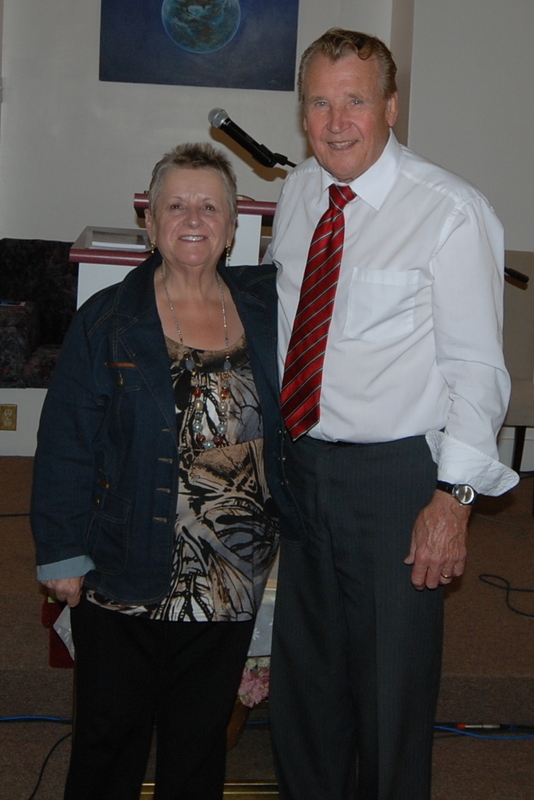 The last 12 years or so I have been very actively involved in the worship team at Gospel Chapel in LaBroquerie Mb. About 6 weeks ago we began going to a local church here in Steinbach, the Evangelical Free. I have worked for Child and Family Services since 1981 as a care provider for mentally and physically challenged adults. 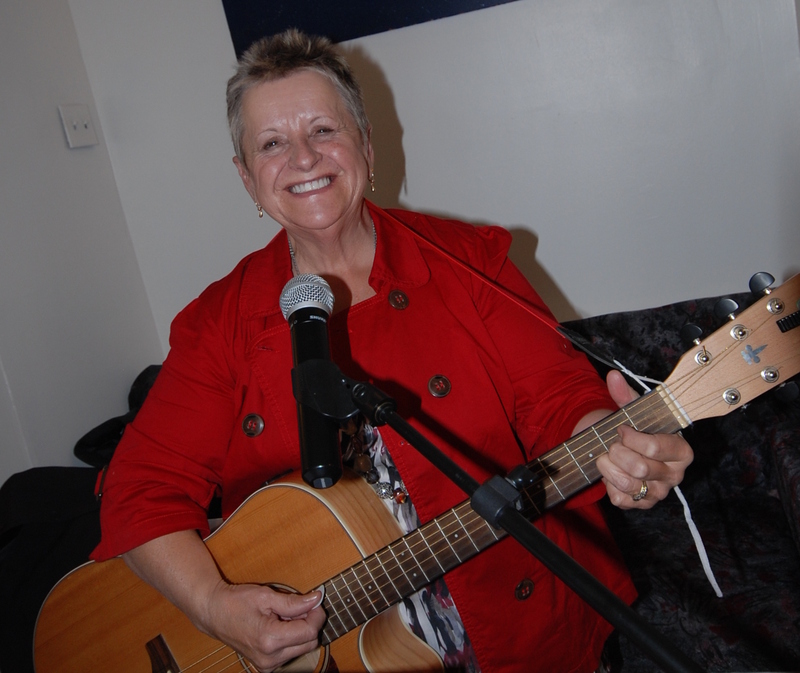 I sing in a group called "The Goodwill Singers" and we minister in song regularly to seniors in apartment complexes, and also in nursing homes and at Gospel music festivals in Manitoba. This I enjoy very much.